Ever After slot immediately struck me as having a dark side to it when first playing the game, not just because of the appearance but the soft yet creepy musical soundtrack and dramatic effects when the reels stop on certain icons. The translucent reels sit over a house hidden in the forest so it's very 'Brothers Grimm' and sits somewhere in between Netent's childish Fairytale series and iSoftBet's Paranormal Activity in the spookiness scale. How frightening will it be for our bankroll? The 5 reels of 3 rows each provide us with a rare NextGen 243-way format as they used in the classic Medusa 2, with single icons. You can play for as little as 15 coins though and the Girl character pays 4x bet for 5-of-a-kind with the Boy paying 50 coins, Owl 40, Mouse 30 and the 4 card suits all paying 20. Wilds appear on all reels and as we shall soon discover extra Wilds can be created randomly but whichever a full way of 5 will pay 20x bet. Mirror Scatters appear on all reels and will not only trigger our free games for 3 but all 5 pay a decent 100x bet. The Fairy Faye can appear randomly and cause trouble on our reels, all of it usually good! Up to 3 symbols on reel 1 become 'enchanted' when she appears and these will replicate their enhancement on all the other reels. If Wilds these will expand, if scatters you see boosted free games with more spins, if characters are chosen they become Wilds and finally the card suit gems will upgrade to a character icon. Either 3, 4, or 5 Gold Mirrors will trigger 6, 12 or 50 free games respectively. If though the Mirror Magnificent feature is active and a Gold Mirror was on reel 1, the Mirrors are upgraded to Purple and you only need 2 to get 6 free games, 3 awards 12, 4 awards 30 and all 5 gives us the maximum 60 spins. 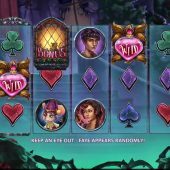 These can be retriggered and as you may have envisaged the Mirror Magnificent feature is enabled on every free spin you play to make an extremely entertaining bonus round! 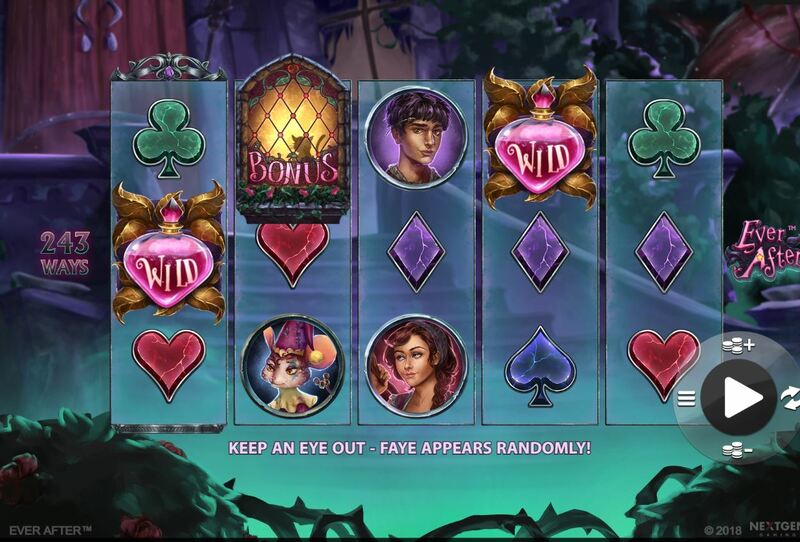 Ever After slot is quite entertaining especially with the random Faye feature, so the free games are worth looking forward to especially as these are more likely to yield the game's best pay, 4860x bet for all 5 Wilds expanding if arriving while Faye is active. The RTP is slightly lower than usual for Nextgen at 95.46% but nevertheless we have a highly playable slot here with good graphics, sounds and potential. The base game isn't likely to pay much over 20x bet because the icons aren't stacked but as I said it's all about the free spins here which are quite volatile! Can you live happily ever after with this slot?